"This book is crammed with distilled, practical wisdom for key account managers and their directors. Organizations claiming to practise key account management should equip everyone involved with a copy, so they really understand what they are supposed to be doing. Anything less is just old-fashioned selling." How do companies achieve key account management? Diana is the Managing Director of Marketing Best Practice, a Visiting Fellow at Cranfield School of Management and Associate Fellow at Warwick Business School. In 1998, together with Malcolm McDonald, she founded Cranfield's KAM Best Practice Research Club of blue-chip companies, which has proved a major driving force in understanding and advancing KAM. An exceptionally experienced practitioner, she has developed the key account management capabilities of leading companies and about three thousand of their people worldwide, through consultancy, teaching, coaching and writing. She has created some of the most popular concepts and tools in KAM in use today. Before you read this book! 1 The crucial role of key account management. 2 Selecting and categorizing key customers. 8 Planning for key accounts. 9 Processes - making key account management work. 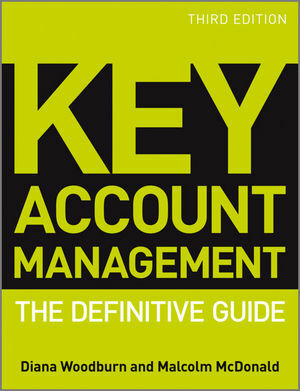 10 The role and requirements of key account managers. 11 Performance and rewards in KAM. 12 Organizing for key account management.